August 27, 1968, the day Woman is My Idea rehearsals started, an item ran in the New York Daily News with a photo of Lara, with the caption "Lara Parker to Bow on Broadway." "Lara Parker, who has been playing a running role as a scary witch in daytime television's Dark Shadows series, will make her Broadway debut as the femme lead in Woman is My Idea," wrote the Daily News' Lee Silver. "Apparently Miss Parker has not been typecast. She has been assigned a love interest. [She plays] a Morman maiden who sets her cap for a prominent Mormon bachelor." 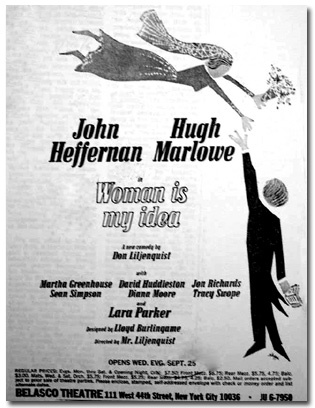 Woman is My Idea, was a comedy set in 1870s Utah -- where many Mormons had many spouses. In the play, Lara’s character, a lovely orphan named Emily Wendridge, developed pneumonia and seemed to be on her deathbed. John Rocky Park, who had managed to stay single while all his friends married, took pity on the girl’s dying wish for him to marry her so she’d have a husband in heaven. In a predictable plot twist, of course Emily recovered and the reluctant groom was eventually won over by her charms. Likewise, critics were captivated by Lara. Cue magazine called her "enchanting," and the New York Times' Clive Barnes said her "spectacular radiance...charmed even while it made the reluctance of her partner all the more incomprehensible." Unfortunately the play itself got bad reviews. It lasted for only 15 performances (10 of them being previews) before closing at the end of September 1968. 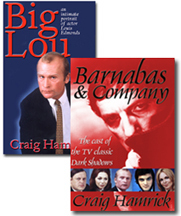 For more stories about the Dark Shadows cast, read Barnabas & Company, available on Amazon.com.